His passion to spin the vinyl evolved at the end of 2004. He is an ambitious and self-taught artist, who has gradually developed his skills and gained experience. In summer 2005, he took part in the young talents contest organized by Mayday Polska Team and performed at Soundtropolis Festival, Poland. At the same time he joined the booking agency Substanz.art, which associates Polish artists. In the Internet poll pure clubbing 2005, he was voted the 6th best (www.pureclubbing.pl) . 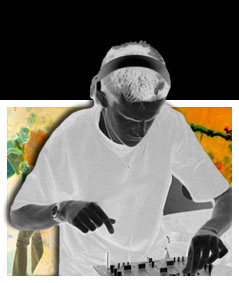 He has djed at many prestigious festivals, both Polish and international, among them: Love Parade 2006 (Berlin, Germany), Mayday 2005 (Katowice, Poland), Soundtropolis 2005 and 2006 (Ogrodzieniec, Poland),Nature One 2007 and 2008 (Katowice, Poland), Creamfields 2006 (Wroclaw, Poland), Tunnel Carnival 2008 (Katowice, Poland) and Electro Sounds Festival 2007 (Ujazd, Poland), Sounds Of Electrocity 2009 (Wrocław), Freak On Festival 2009 (Wloclawek), Labyrinth Of Sound 2009 (Janów Lubelski), Electronic Festival 2011-2012 (Kraków), Bass Planet 2012 (Szczecin), Massive Sounds 2009-2012(Wrocław/Katowice), Silesia In Love 2012, Nature One 2012: You Are Star (Raketenbasis Pydna, Kastelaun) . In 2005-2008 he also presented hisincredibly energetic-eclectic sets in many clubs, in Poland and abroad; he performed in Pulp Mansion (Berlin, Germany), Mondo Club (Dundee, Scotland),Good Bits/Irlandia), Art College (Edinburgh, Scotland), Crossed (Szczecin, Poland), Kanty (Jaworzno, Poland), M25 (Warsaw, Poland), IQ (Poznan, Poland), Grafitti (Lublin, Poland), Ego (Katowice, Poland), Browar Mieszczanski (Wroclaw, Poland), Eskulap (Poznań), Lokomotywa (Szczecin) Forty Kleparz (Kraków), Art. Cafe (Toruń), Graffiti (Lublin), Ex-Zatem (Zielona Gora), Port West (Lod), Ego (Katowice), Snoofa (Stargard Szczeciński), Alchemia (Szczecin), Graffiti (Opole), Havana (Zawiercie), Klub 69 (Chełmek), Promenada (Opole), Regres (Bytom), Jazzgot (Nowy Sacz), Krelarnia (Koszalin), Fobia (Jaroslaw), TTstacja (Nowy Sacz), G3 (Lambinowice), Tlen (Bielsko Biala), Stary Browar (Wloclawek), Summer Trip (Zalew Zemobrzycki k. Lublina), Music Grill Party III (Zieleniewo k. Stargardu Szczecińskiego), Przestrzeń Graffenberga (Warszawa), Impuls (Katowice), Kandelabra (Biała Podlaska), Aperol Club (Lublin), Pokusa (Stalowa Wola), Big Star (Brzeg), Szklarnia (Warszawa), Amsterdam (Gorzow Wielkopolski), MC Klub (Lublin), Studio 21 (Jaroslaw), D-Sign (Lublin), Nitro (Olkusz), Piramida (Chorzow), Techno Gorki (Gorki k. Opola), Krzysztofory (Krakow), Stolarnia (Czechowice Dziedzice), The Palace (Warszawa), Ring (Bojszowy), Insomnia (Ososwiec k.Opola), Electronic Connection (Jaworzno), Heaven (Pionki), Green Wave (Proszkow k.Opola)Vip (Zabrze), Membrana (Czestochowa), Fantasy Park (Sosnowiec), Rio Club (Sosnowiec), Rampa (Opole), Discopark (Rudki), Neopolis (Mogilno), Festyn (Zaolszynie), Sydney (Zarzecze), Intro (Wroclaw), Makador (Stargard Szczecinski), Lost Highway (Krakow), Alternatywy (Stalowa Wola), INQ (Katowice), Electric Cafe (Jaworzno), Vip Club (Opole),Master Qlub (Jaworzno), Osrodek Capitol (Wroclaw), Fabryka (Opole), MOK (Pionki), Palladium (Warszawa), Arythmia (Bielsko Biala), Obsesja (Lublin), Andergrant (Olsztyn), Soho (Sosnowiec), Metro (Bialystok), Boom Bar (Szczecin), Grant (Bielsko Biala), Number 01 (Wodzislaw Slaski), Tunel (Kedzierzyn Kozle), Pub Element (Dobrzen Wielki),Czekolada (Chorzow), Mish Mash (Krakow), Baobab Klub (Tychy), Liquid Frequencies (Chroscice), Luzztro (Warszawa), G2 (Radom), Chilli Klub (Rzeszow), Ground Zero (Borken | DE), MegaClub (Katowice), Cien (Krakow)and many more. He has djed along with such artists as: Sven Vath, Paul van Dyk, Westbam, Richie Hawtin, Mauro Picotto, Chris Liebing and more. He recorded his first tracks in 2010. He feel best in the wider techno. The year 2009 is a time for change-new project (Andar) and music style, different perspectives.His sets are mixtures of carefully picked melodies ranging from techno, minimal or tech-house. He is also an active party organizer in Silesia-he co-organizes Massive Sounds Parties, which host famous electronic music artists.